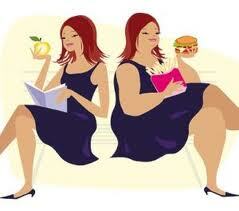 According to Gallup’s Annual Health and Healthcare Survey, today’s average American woman weighs 160 pounds. That is UP 20 POUNDS from the 1990s! This increases the likelihood of the “average” woman experiencing heart disease, diabetes, cancer, and other chronic diseases. How do we combat this epidemic? I got a kick out of the picture in the blog as I used to look JUST LIKE THAT. I topped the scales at 319 pounds (YUCK) and am down 87.1# as of today. Hoping to hit the 90# mark soon. Thank you for the links on eating clean. I’m finding eating clean to be a HUGE help with my lifestyle change. Congrats on your weight loss and new lifestyle! I bet you are feeling so much better! Keep up the hard work and 90 lbs will be here before you know it!